If you drowned and the sea spit you out, thrusting you back into an age of pirates, buried treasure and beauty beyond belief... would you stay? Ricky Bradshaw has never sailed the Caribbean Sea, searched for buried treasure or battled pirates on the deck of a Spanish Galleon. He's never fallen through the floor of Davy Jones' locker, befriended a witch doctor or watched an old fisherman morph into a porpoise. All Ricky knows is his lonely life with his widowed mom in a tiny apartment overlooking a marina on the Chesapeake Bay. But all that changes on a snowy Christmas Eve when Ricky's apartment building burns down and he falls into the chilly waters while trying to save BARNACLE, a mangy mutt with shrimp breath. Suddenly Ricky finds himself confronted by his neighbor, a young woman in a pink bathrobe who jumped to her death in order to escape the flames. She offers him a choice: go with her to a wonderful afterlife where snowflakes taste like candy or return to the dreary old world he knows. Ricky picks the past and awakes on a raft in the middle of the sea where there is surprising beauty on every island, danger around every corner and great honor and glory ahead of him... if only Ricky can summon the courage to survive the curse of Captain LaFoote. Homeschool subjects covered: Literature, character studies, books for boys. The Curse of Captain LaFoote is another great book for your homeschool library! A Selah Award winning title. If you drowned and the sea spit you out, thrusting you back into an age of pirates, buried treasure and beauty beyond belief... would you stay? Ricky Bradshaw has never sailed the Caribbean Sea, searched for buried treasure or battled pirates on the deck of a Spanish Galleon. He's never fallen through the floor of Davy Jones' locker, befriended a witch doctor or watched an old fisherman morph into a porpoise. All Ricky knows is his lonely life with his widowed mom in a tiny apartment overlooking a marina on the Chesapeake Bay. But all that changes on a snowy Christmas Eve when Ricky's apartment building burns down and he falls into the chilly waters while trying to save BARNACLE, a mangy mutt with shrimp breath. Suddenly Ricky finds himself confronted by his neighbor, a young woman in a pink bathrobe who jumped to her death in order to escape the flames. She offers him a choice: go with her to a wonderful afterlife where snowflakes taste like candy or return to the dreary old world he knows. 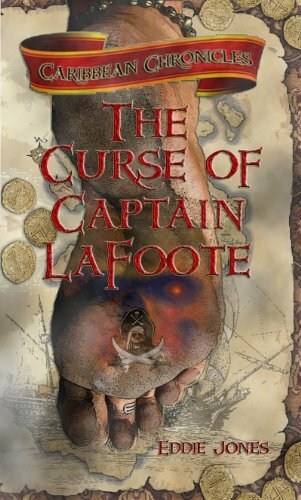 Ricky picks the past and awakes on a raft in the middle of the sea where there is surprising beauty on every island, danger around every corner and great honor and glory ahead of him... if only Ricky can summon the courage to survive the curse of Captain LaFoote.